The Most Awaiting magnum opus of the Indian Cinema Rajinikanth, Akshay Kumar, Shankar combination Robo 2.0 Movie released Today. 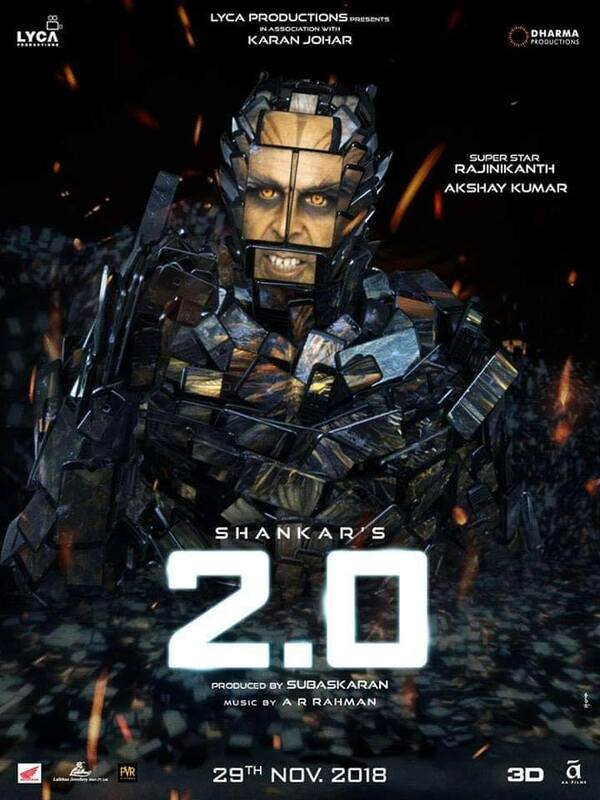 Robo 2.0 Movie is the Sequel of Enthiran(Robo) which released in 2010 and became a huge Golden Blockbuster at Indian Box Office. Now it’s the time of waving it’s latest version 2.0. Here is the 2.0 Movie Review Exclusively for you. 2.0 Movie is the India’s most expensive Magnum Opus Sci-fi Thriller big budgeted movie made with Rs. 543 Crores. 2.0 is the Pride of Indian Cinema which takes it to the next level. Now it’s the waving time of 2.0 Movie. The Long waiting of 2.0 Movie is over. 2.0 Movie is directed by Shankar Shanmugam so called Spielberg of Indian Cinema. 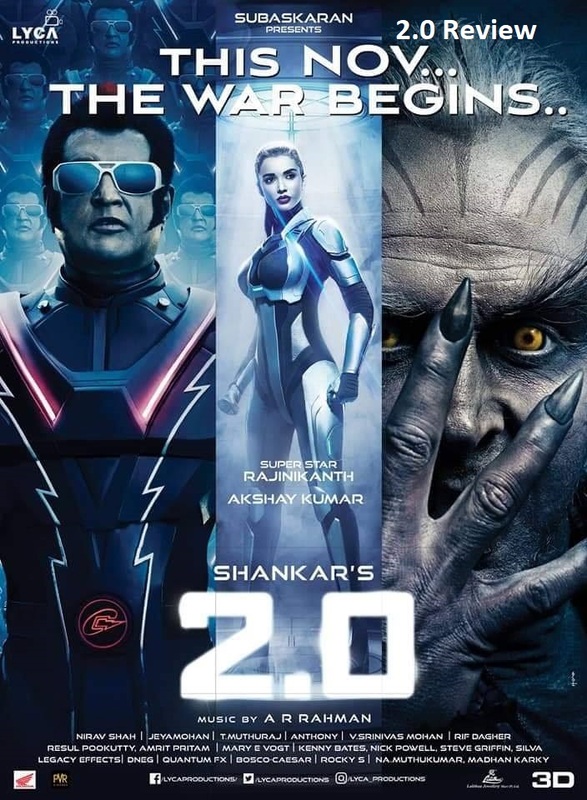 The 2.0 Movie is Starred by Rajinikanth, Akshay Kumar, Amy Jackson, Sudhanshu Pandey, Adil Hussain, Kalabhavan Shajohn, Riyaz Khan playing the lead roles. Produced by A. Subaskaran, Raju Mahalingam, Written by S.Shankar, B.Jeyamohan, Music and Background score by A. R. Rahman, Cinematography by Nirav Shah, Edited by Anthony, Sound Designing by Resul Pookutty, Art Direction by T. Muthuraj, Visual Effects supervising by V. Srinivas Mohan, Production company, Lyca Productions, Distributed by Lyca Productions, Dharma Productions. You can see the Shankar’s magic of racy Gripping Screenplay and Stunning Hollywood level Visual Effects. This world is not only for Humans………Yes it’s true this World is ruled by nature where all the living things that can breathe are the children’s of the mother nature. Just we can describe as Animals, Birds and Trees. But the most disastrous and disgusting thing is that the World is dominantly ruling by Humans. The Humanitarians are apparently spoiling, Destroying and Polluting the Mother Nature. This causes harmful to all other non humanitarians. If the Non Humanitarians turns wild and takes revenge on Humans. What would happens next just imagine…same thing happens here Which want convey that this World is not only for Humans…..A Living thing that hurts badly by Human nature and turns so wild. It’s came to give a counter Attack on Humans . Which is so called Fifth Force. Which is unstoppable by any Humanitarians. Then Scientist Vaseegaran enters in to Ring. He recalls the dismantled Chitti the Robot with upgraded 2.0 reloaded. But The Chitti can alone control the Super Power of the Fifth Force. It’s almost needed another Super power to stop and eliminate the Fifth Force. SO what the another Super Power that can stop the Fifth Force along with Chitti… How the Consequences are changed drastically while Controlling the fifth Force. Whether they Destroyed the Fifth Force or not are the rest of the Story. Just go to your nearest theaters Watch and enjoy the Visual feast Robo 2.0 Movie in 2D and 3D Formats. The 2.0 Movie is Absolutely Directors Movie. But It’s always proved with Star cast best performance once gain proved this. In the Age of 60’s Super Star Rajinikanth played in and as 3 Lead roles which are no words to say, it’s exceptionally amazing. Akshay Kumar as Fifth Force simply untold…..it’s mind blowing performance. Amy Jackson and the all other lead roles are simply awesome. We are already crystal cleared that it’s a directors movie. But there is huge scope for all department like Cinematography, Screenplay, Editing, Art, Music and Back Ground Score with Superb Sound Engineering. All are Technically takes the movie in to the next level of Indian cinema. But We definitely give a huge applauds to another Team that they are Visual effects Team. It’s Stunning, racy, Mind boggling Visual Effects. We can call it as Technical Brilliance in terms of Visual Effects play a crucial role in the Movie. There is no words to say about them. This world is not only for Humans……… It’s a Crystal Clear message…..Go and Watch the Indian Spielberg Shankar Shanmugam Magnum Opus and Pride of Indian Cinema 2.0 Movie in theaters. Enjoy the Visual feast. 2.0 Movie bigger than Baahubali – The Beginning and Larger than Baahubali – The Conclusion. 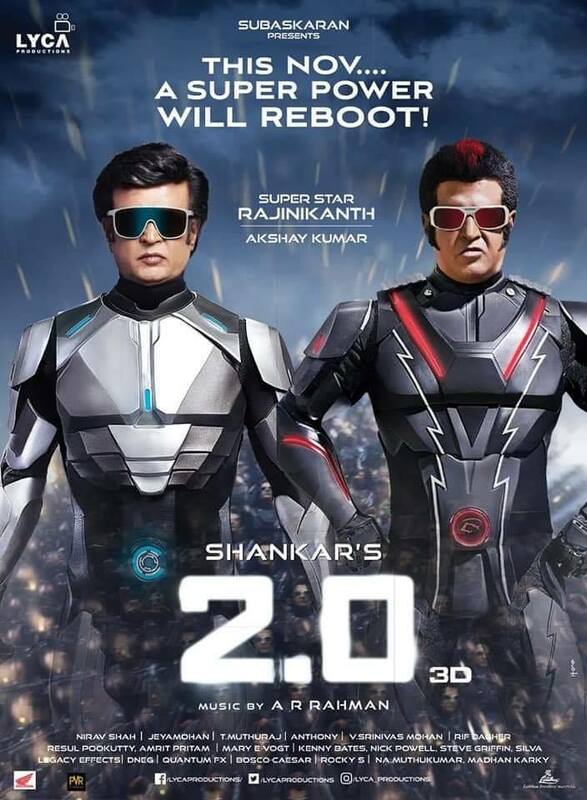 2.0 Movie Review: 2.0 Movie is the India's most expensive Magnum Opus Sci-fi Thriller big budgeted movie made with Rs. 543 Crores. 2.0 is the Pride of Indian Cinema which takes it to the next level. Now it's the waving time of 2.0 Movie. The Long waiting of 2.0 Movie is over. Next2.0 Starts with Earth shattered openings on First day!